15.5 million Americans play casual or pick-up basketball. 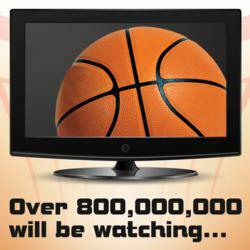 On average, home basketball systems are used 13 hours/week. As we approach the start of the NCAA (R) Division I tournaments, America’s love of basketball is evident. While as many as 1,900 players will play in the tournaments this year, over 26 million Americans play basketball (according to the SGMA’s U.S. Trends in Team Sports research). 15.5 million people play casual/pick-up basketball. According to a Goalrilla study, basketball goals at home are used an average of 13 hours per week. In-ground basketball hoops average 14 hours per week. Portable hoops average 12 hours per week. 4.1 million people play basketball in organized leagues. 5.8 million play on a school or college team. More people play basketball in the U.S. than any sport. Baseball, with the second largest group of U.S. participants, is played by 14.6 million people, just 56% of the total playing basketball. For more information on basketball participation in the U.S. view Goalrilla’s infographic: Many Play, but Few are Invited: U.S. Basketball Participation.